The Splendid Sampler has been going on for almost a full month! It has been a blast making all of the beautiful blocks with such a variety of techniques. 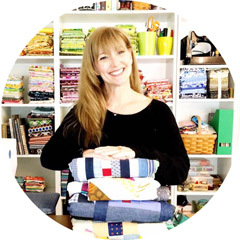 I love looking forward to seeing what is coming up next with the Sew Along! If you have not joined in, you are welcome hop in at any time! 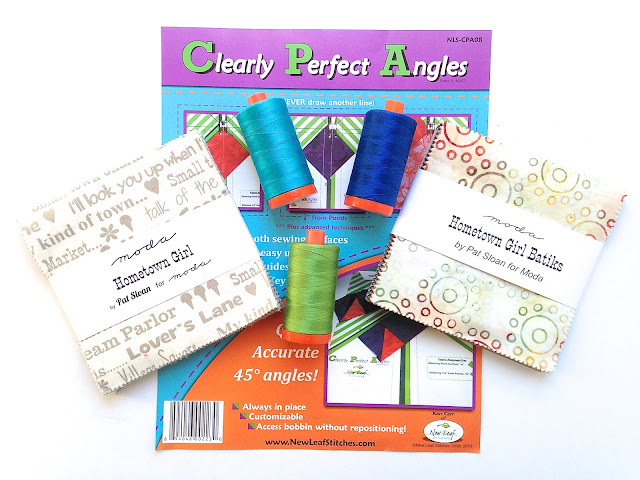 One winner will receive one Clearly Perfect Angles courtesy of Kari Carr from New Leaf Stitches (thank you Kari), two FAB charm packs of Hometown Girl by Pat Sloan for Moda Fabrics and three large spools for Aurifil 50wt thread in three stunning colors!!!! You do not have to be participating in The Splendid Sampler Sew along to enter! You are not required to do all of the options to be entered. Choose one or all! Your chances will increase with the more options you choose :o) A random winner will be chosen by Rafflecopter and I will contact you by email on or about 16 March 2016. Thank you everyone that participated in the FUN giveaway! I prefer piecing. I would like to do more machine applique, though. Wow, what a great giveaway! Thank you so much. I really like everything about quilting. But piecing is my favourite part. I go for applique! Takes time, but worth it. I love piecing. But with splendid sampler I started to enjoy appliqué. I like piecing. I am fast becoming an applique fan though. More applique is always fun! I like piecing, especially paper piecing! Thank you! I love applique in any way! But stitching and embroidery the most! I prefer the look of piecing. I love the blocks I've seen for this sew along. I am waiting for my fabric to arrive then I'll be busy sewing. Thanks for the chance to win! I love to improv piece. It's so liberating! HI,piecing is my most favorite!Thank You! I love piecing, but I am going to give EPP a try. It looks like fun and I am hoping I can figure it out. I have done both and they're really not my favorite things to do, but I prefer appliqué over piecing any day. I am a chain piecer, I'm not one for hand sewing of any kind. I prefer piecing. EPP is fun too but so slow! I love epp, one quilt waiting for quilting and starting another one. I have been piecing or 25! years, and am taking an applique class in April. I prefer piecing. I don't have the patience for EEP! it is amazing to me how quickly (2-3 months) I made all my flowers. I am usually a chain piecer! I love piecing and applique. Thank you for the giveaway. Paper piecing is my very favorite! And giving people wonderful handmade gifts. I love piecing, but I really want to work on practicing applique because some of the patterns you can make are so lovely! My favorite is free motion quilting, but I enjoy pep, paper piecing, and appliqué. I love piecing and paper piecing. I had my first EPP class this past weekend - still very new! Thank you for hosting such a generous giveaway! I love doing applique. Thanks for the great giveaway and thanks for your inspiring blog! I love to do piecing. I love piecing, especially hand piecing. That is how I learned and it is so calming. I like piecing the best. PP is a little harder and applique is 3rd on my list. My favorite is piecing but I also love needle turn applique. I love hand applique, but am currently on an EPP jag...just finished my first totally hand pieced quilt with EPP and working on my second. Amazing how much you can get done while riding in a car! Thanks for the giveaway! Thank you so much for this fun giveaway! I love all kind of techniques but am currently working on EPP. Love that! My favorite? Depends on the day! Actually I like piecing combined with applique....Although I have periods of time when I just want to do EPP! Glad there are so many techniques to choose! I tend to be a piecer,although I REALLY want to be a quilter! I love looking at the beautiful quilting others do and wish I could do that too. I really need to practice more ;) Thanks for a great giveaway. I love this giveaway! Thanks for hosting the fun!! I love to piece but haven't been doing it long at all. Loving the chance to win this giveaway. I love hearing about new blogs and Pat Sloan introduced yours to me by mentioning your give~away. Very Nice! I love machine piecing but am trying all the methods that are discussed and explained in the sew-along to help me learn some better skills and ideas with my sewing. Thanks for providing the give~away and I appreciate you working on the blog. Time to go browse through it some more! I haven't had too much experience with piecing but I have done a bit of EPP (hexies!). Thank you for this opportunity! Love piecing!!! Just learned paper piecing which was FUN. I do a lot of EPP since my son was born last year because I can take it anywhere and I don't get a tone of time at my machine. The Splendid Sampler is the most time I've spent at my machine since my son was born. I would love 💛 to start making the spendid sampler! It looks like everyone is having so much fun doing it! I enjoy piecing, but my favorite is needle-turn applique. I enjoy piecing the most, but love most techniques. I recently started EPP and am enjoying the process. I've also done machine applique. Thanks. I prefer piecing and EPP. Basically anything but appliqué! I have never done curves. This would be a great way to start. Great giveaway.. Have not done applique. I like piecing, haven't mastered curves yet. I prefer piecing by far, then applique. Thanks for a chance to win. I am new at quilting & only working on my 2nd project. I appliqued hearts on it & now I am in love with appliqued. Paper Piecing!!! That's my favorite ~ everything comes out just like you want it to with paper piecing! Unless, of course you use fabric you don't like, then it's not so great. That has happened to me. I love piecing. My technique still needs improvement, but I an enjoying the learning process! Thanks for the chance to win! Love seeing all of the Splendid Sampler posts. Thanks! I've been trying to decide what fabric to use for the sampler....maybe this could be my jump off point! I am a piecer but do applique and epp too. I love geometric design! I prefer piecing. Originally was taught by my mother and grandmother to hand piece. Still learning machine piecing and love to challenge myself, especially with the Splendid Sampler. I like to hand piece-- so portable and relaxing. I am warming to machine piecing. I also hand applique. I enjoy piecing. I am not too good at applique. Still getting the hang of it. I like both regular piecing and paper piecing. I'm not sure what I love the most about quilting: choosing fabrics, piecing, the sound of the machine or rolling around in the finished project! Thanks for a great give-a-way! I like to add machine applique. Thanks for the chance to win!! I love applique and piecing. Thanks for the giveaway, I would really like to try the angler!! How lovely of you and Pat to host this giveaway. In less than a month of doing The Splendid Sampler, I've learned more than I ever learned on my own! I love piecing and just learning appliqué. Thanks. Thank you for offering this opportunity. I enjoy piecing - but enjoy even better learning about and trying other venues. It's good to work outside your comfort zone and learn with friends from around the globe. I love both piecing & applique . Right now I am enjoying wool applique, but I'm itching to get back to some EPP. I love the zen of 1/4" seams and watching the blocks come together piece by piece. Also enjoy EPP. I have mixed feelings about applique as my eyes are not great for hand and I don't like the stiffness of fusible. However, I do incorporate applique as needed. I am really enjoying the Splendid Sampler journey so far. Learning a lot of new techniques. Applique is my favorite, I live the feel of fabric in my hand! I love piecing; applique, eh. It's okay. But I do the applique, when I want the quilt. My favorite is applique. I love how The Splendid Sampler is challenging us to try different techniques! I just learned hand embroidery - and I like it - who knew?!! Thanks for the chance for this awesome giveaway!! My favorite part of the quilting process is piecing and choosing the colors so the artistic magic comes alive. I do plan on learning more about applique. Would love to win something. I enjoy piecing, but I like knowing a variety of techniques so that I can tackle any project! Hand applique and paper piecing are great, and I have recently learned EPP. Thanks for the giveaway! I really like epp. I have made 3 quilts with some epp in them. What I really like is foundation and crazy quilting. Foundation because it gives me the sharp crisp lines and crazy quilting because it gives me the freedom to do what ever strikes my fancy at that moment. I am an applique addict!!! My favorite quilting techniques is needle turn applique. I also like working with wool. Thanks for the chance to win. I am new to quilting am have taught my self. I mostly do machine piecing and simple patterns. I joind the Splendid Sampler to learn new techniques. I love paper piecing (although it is a new skill I am learning). I have 3 quilts in que that I am hand quilting. I love doing it at night while I watch TV With my family. I have tried both with equal success by my not too good standards, but I keep practising. Love the giveaway. I love foundation paper piecing most, but all quilting techniques are awesome! I love all types of needlework, embroidery, sewing, machine and hand quilting. The Splendid Sampler is looking to be an awesome mix of those techniques. Thank you for the giveaway! I love piecing. Thanks for hosting a give away! I like piecing but love applique during "down time" while watching TV. I would love to win this great giveaway! I am a piecer but do enjoy applique. Also enjoy hand piecing when I need something portable! Thanks for the chance to win!! I enjoy doing all of it. It depends on my mood. I am a relative newbie to quilting. My favorite part is picking out the fabrics and then piecing. What a lovely give-a-way. Thank you! I don't really have a favourite quilting technique so far, but the Splendid Sampler Quilt Along is teaching me many that I will definitely be putting to good use in the future! Thank you for hosting such a wonderful giveaway! Good luck to all! What a wonderful give away! I love the Splendid Sampler, I have learned so much. I look forward to Thursday and Sunday. Right now I prefer piecing, but I am starting to like applique as well. I have been enjoying the Splendid Sampler. I bought the CPA but have not yet installed it on my machine. I love piecing but would love to do more applique. My favorite is hand applique but I am loving all the different piecing practice I'm getting through this sew along! The Splendid Sampler are a fun journy. I love to make quilts ,all sports. I prefer piecing by machine, but I also enjoy working on my EPP hexies too! This is so generous of you. And it feels good to know that there are lots of experts doing this sampler with us. I like piecing! However, I have not tried all of the different methods yet, because I'm still new to quilting. I don't think I have a favorite technique. I love appliqué, but from time to time, I need to do some piecing and then go onto EPP. Just love all of them, what can I say? I love picking the fabric for a project! Thanks for the chance to win. I love to piece, but I also love machine applique, oh, and I love hand applique while watching tv! Thank you for the great giveaway! I love to combine piecing and applique in my quilts. I have been into applique lately. Thanks for the chance! I love piecing and learning new techniques.....I love seeing how different color combinations work together. I prefer piecing to other methods but use all at different times. Love all ways to piece long as I'm in my happy place! Thank you for the wonderful give away! Thank you for such a great giveaway! I love your block! I am really enjoying the Splendid Sampler Party - learning something new with each block. Thank you and all the other designers for giving us this great opportunity to get out of our comfort zones. Thank you also to Pat and Jane for all of the hard work in planning, controlling and facilitating this program. You all are to be commended! I love to machine and hand piece. I love to hand applique and use my embroidery machine for applique. I love to quilt!!! I love epp, because you get nice corners using papers. I have made my first needlet urn block, was fun. Thanks for the chance! I really enjoy piecing the most. I love seeing the blocks come together and then the quilt design come together. It is like a jigsaw puzzle. I love The Splendid Sampler and I love giveaways! Thanks for your interesting blog! Piecing is my favorite quilting technique. I like hand applique the best. It is very relaxing to me. I like piecing and learning anything new about quilting! Thanks for the great giveaway! I go to spend yesterday w/Pat in class and learned so much from her! Me encanta el patchwork y todas sus técnicas. Muchas gracias. I like piecing the best, but like trying new things too! Thank you so much for doing this. I enjoy piecing and appliqué and need to brush up on my embroidery skills. Thank you for the chance to win such great prices!! I'm a piecing girl: traditional or paper-piecing with occasional quilt-as-you type piecing! Thx for the cool giveaway! I love piecing and embroidery! Thank you for this chance to win some sew lovely things! Piecing is my favorite method, anticipating and enjoying other methods in this splendid sampler so far. All love hand work and really enjoy needle turn applique, EPP and embroidery. I honestly love it all...being creative is so relaxing! My favorite thing is machine piecing and using my machine for other techniques as well but I do like hand work for the unique stitches that you can achieve! I love to piece and play with fabric. I like pieceing, so far. I'm a beginner at this. Thanks for the great giveaway! I prefer piecing but will do applique on occasion. Thanks for this chance! I love piecing the most, but am open to learning others as well. Piecing is my favorite method! Thanks for the give-away! Great items to win!! I love piecing and, tho I have lots of experience w/it, I'm learning LOTS from reading all of the tips that have gone w/The Splendid Sampler. Today's by Joan Ford (Hummingbird Highway) is tops! I am new to patchwork and quilting and I have enjoyed all the blocks so far but I am especially enjoying piecing. I am fairly new to quilting and loving all these new techniques through the splendid sampler. My fav so far is piecing. I like piecing the best! Applique and embroidery never REALLY feel like quilting to me, personally :) not to say I don't like giving then a try! I prefer piecing but only because it's mostly what I have done. I do loving learning the new techniques. So this is a great opportunity! I love EPP, and Applique. Love what you all are doing here. Piecing~ including paper piecing. I like to do fusible applique, but needle turn really slows me down. LOL Thanks for the fun! I love paper piecing,and EPP! They both are my favorite. I enjoy quilting by hand. I have just finished piecing Katja's Milli EPP quilt top. I would love to win the giveaway. I am using my stash to do the Splendid Sampler. Thank all of you designers for all of your hard work to bring this sampler to us.